Taking down a top contender was the agenda Wednesday night as the SF State women’s volleyball team defeated Sonoma State in five sets to claim first place in conference play. Sonoma State recently improved to a No. 22 ranking last weekend only to succumb to SF State in a hard fought battle. The victory helped SF State improve its record to 6-1. Going into tonight’s game, SF State and Sonoma State were in a four-way tie for first in the CCAA conference. University President Leslie E. Wong attended and cheered on the Gators through the wild roller coaster ride of a game. The Gators led early on against the Seawolves and managed to close out the first set with a win. Leading into the second set, both teams were evenly matched with a .444 hitting percentage and more than 15 kills. The Seawolves went on to outhit the Gators and take sets two and three, making the fourth set a crucial win. The crazy atmosphere in the gym boosted the team’s spirit as the Gators came out swinging, leading the Seawolves throughout the entire fourth set and never letting go. With both teams tied 2-2, the deciding factor was set for the fifth match. Closing with 11 kills in the fifth, the Gators secured the win by outplaying the Seawolves 15-11. Freshman Meagan Wright, who matched her season record of 20 kills believes the support from the crowd helped motivate the team. “We just found all the fire and desire that we wanted and threw it on the court,” Wright said. 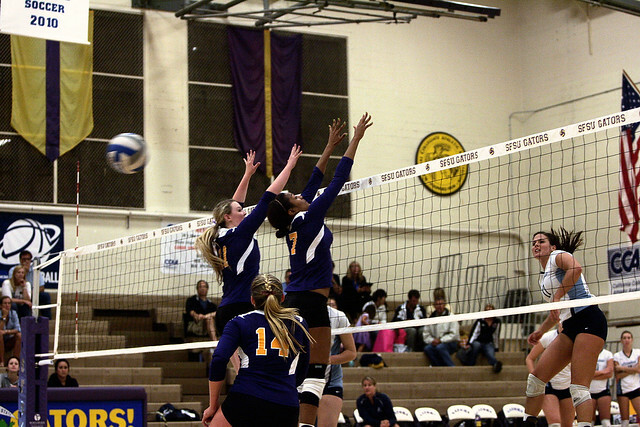 SF State was led by a team best of 71 kills with sophomore Kelly Ostello recording 22 kills. Senior Iris Tolenada contributed to the team’s record with recording her eighth double-double along with reaching a season high of 58 assists. Tolenada praises her teammates for their hard work and dedication in securing the top spot. Head coach Michelle Patton is proud that her team was able to regroup and refocus after losing their early lead. Heading into this weekend’s action, the Gators will face off against Cal State San Bernardino Friday night and UC San Diego on Saturday. Both teams are 5-1 and will be fighting for the number two spot behind SF State.